If you’ve ever experienced the pain and embarrassment of a missing tooth, it probably isn’t going too far for us to state that there’s not much you wouldn’t do to cover that unattractive gap. Luckily, today’s dental techniques and state-of-the-art equipment allows just that. Though dental implants may seem fodder for bad science fiction novels, the dental apparatus is quite real and enormously effective. Increased comfort. 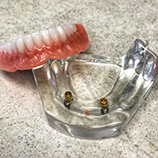 Many denture-wearers complain about ill-fitting dentures slipping, allowing food underneath them and causing pain and bad breath from leftover food particles. 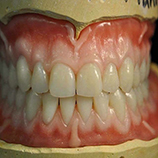 Dental implants eliminate the problems of dentures. A more attractive smile. Because implants are formed to your specific bone and facial structure, they create a much more natural and attractive look as they become a permanent part of your face. Easier speaking and eating. Oral functions can become difficult at their worse, embarrassing in the least when wearing dentures. Chewing certain foods can be very hard as dentures are not stable enough to handle these foods. And dentures have more than once, embarrassed their wearers by falling out while laughing, speaking or eating. Dental implants never slip or fall and use the bone strength to cut through any type of food, just like real teeth do. Improved oral health. Because nearby teeth are not reduced in order to fit or support the implant, their structure and health are left intact. Mouth sores and bacteria pockets are also reduced. Improved ease of care. Implants are intended and built to last for a lifetime, never need messy adhesives and are cleaned and maintained in the same way natural teeth are with simple brushing and flossing. 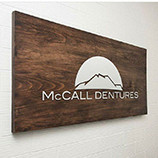 Find out more about dental implants by calling McCall Dentures and smile confidently once again. Please call us at 317-596-9700 to schedule an appointment with the dentist.